A year ago this month, Austrian daredevil Felix Baumgartner achieved an incredible feat: He became the first human to break the sound barrier with his body by skydiving from near the edge of space. On Oct. 14 of this year, Baumgartner got together in Austria with the Red Bull Stratos team to celebrate the anniversary of his record-breaking leap from 24 miles (39 kilometers) above New Mexico. 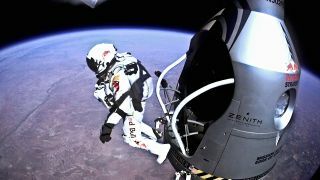 The crew released new "space jump" video footage documenting their reunion and historic achievement. "The biggest outcome that we had so far is that we really developed a lot of emergency equipment and that's gonna be very useful in the future for private space organizations," Baumgartner said in the footage, reflecting on his epic supersonic jump from the reunion at his birthplace in Salzburg. The Red Bull Stratos mission team worked for years to develop the massive helium balloon that took Baumgartner high above earth as well as the spacesuit and other equipment that kept him alive after he jumped out of his capsule, accelerating from 0 to 843.6 miles per hour, or Mach 1.25, in just 50 seconds. The team says their innovations could improve safety for future aviators and astronauts. "Now major aerospace companies come to us for projects they can’t accomplish in a short time frame — because they now know we can," Art Thompson of Sage Cheshire Aerospace, who was the team's technical director, said in the video. "One of the biggest satisfactions for me is though what it did for education, because it inspired millions of kids to start thinking about engineering in aerospace, thinking about other fields to apply to the sciences," Thompson added. "That was one of the greatest paybacks for us." At the reunion in Austria, the team also watched a documentary about the project, "Mission to the Edge of Space: The Inside Story of Red Bull Stratos," which is now available for free here on Rdio, a video streaming service .